In the Crossfire: What happens next? The shutdown is over and the government is reopened (for now). President Obama is moving on with a new agenda. Will he find any takers? Is this a new start or more of the same? 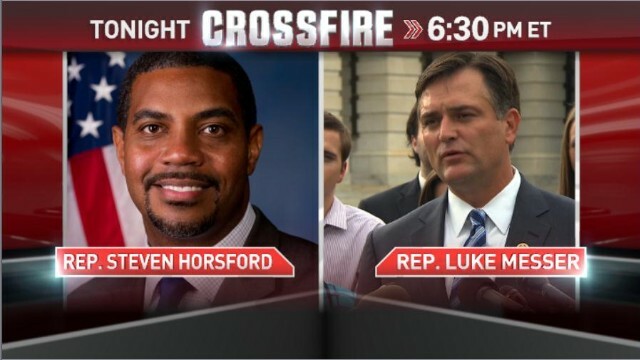 Tonight in the Crossfire: two members of Congress, Reps. Steven Horsford (D-NV) and Luke Messer (R-IN) join hosts S.E. Cupp and Van Jones to debate the future of legislating at 6:30pET. We want you to weigh in. Do you think President Obama will be able to accomplish his agenda going forward? Reply now with Yes or No below, by replying to our tweet, or commenting on our Facebook post. A GOP shutdown. Defund the GOP, or the GOP gets it in the 2014 election. I don't think the president will achieve much more,not for lack of trying, but fire having a Congress with Republicans whose primary objective was to make him a one-term President. Until Republicans start looking out for the good of average Americans and start trying to have a successful government, it will be hard to achieve anything in Washington. Being realistic, it is not politically beneficial for the Republican party for President Obama to successfully bring the country out of the worst recession in world history,as well as leave lasting legacies that make life so much better for average Americans. On the contrary, dramatic failures would guarantee Republican victory in the next elections and as long as the party has priority over the country, Republicans will fight even their own ideas as long as the president supports it. On a certain blog site, if I criticize Obama for anything I am called names. Any one who calls me racist is really a nut so I do not pay any attention to them-it is what they call in rehab a, "Dope Move"- Spin the conversation away from your self and try to lay onto someone else. I do think Obama made a huge mistake in not taking Kruz's offer to delay it for one year. Obama could have made a better case for Obama care during a delay- if he thinks it will work just because of his charm he is wrong. So my big beef and questions are if it depends on folks to buy into it that means that folks will have to make their health insurance payments every month-including the younger healthier folks. But look at how many young folks let their car insurance go? It will be a paperwork, audit, etc night mare. Clark Howard said there are 3 plans: Bronze, Silver and Gold. He said as it stands and what he can kinda figure out as Clark says it is extremely confusing, the Bronze plan only covers about 70%. Now most of the folks who purchase the Bronze will be the lower income or the younger folks. So now how in the heck and why would anyone in gov think that this group will be making regular monthly insurance payments and then also have to pay aprox 30% of their medical bill. I read somewhere that medical bills are the biggest single cause of bankruptcy in the US. Considering the number of uninsured or people who have insurance but can't cover their children, 70% is a lot better than nothing. I haven't heard practical plans to improve that if that's the problem, all we've heard from Republicans is end it. In what way is nothing better than something? With 70%, a $10,000 bill for having a baby becomes a $3,000 burden. I think that's an improvement. Think of the many grandparents raising their grandkids who have Medicare but no coverage for the kid, what do they do if the child is in an accident? Republicans keep saying we spend too much money. True, but when they start 2 wars which are still on whuich have cosrt this nation trillions in revenue; it is ignored as if it never occured. They still want to reduce spending by cutting social security; again they stole social security funds fo9r purposes not related. Again not mentioned as if it didn't happen. Fight about obamacare; but these self same congresspeople are getting the fibnest of healthcare without spending one cent from their pockets. Incase you weren't aware of it, the congress pays zero into the social security funds whle demanding that the people who did pay into it for 50 years are really not entitled to it. Appar3ently the US government they represent are entirely made up of the republican party now dominated by the tea party . Sa commentary on how congress approaches the vows made to work for the good of the American people while only working to keep themselves in office at the expense of the USA. Obama failed terribly at leading your country. Somebody should have reminded im that although he ran on a democratic ticket , once you become President you become the leader of all people in America. Quite frankly he wasn't and still isn't up to the task as one has seen over the last few weeks. There is no decorum left in the White House and Congress and your television shows are overrun with mean spirited members from both sides of the house and the insults are nauseating. Yes , things have become bad because nobody is in charge. Here we go again , blame it on racism. Educate yourself and see the bigger picture. Borrowing and spending is not the answer to debts and deficits , eventually you max out and then what. It burns me up when folks say that-he was elected and than re-elected. And he is half black and half white. So stick to facts and please quit the drama. He is criticized in American as every President is-that is America and we love to critique our politicians. He has not kept his promises-he is an American politician-we are use to them not keeping promises. When he leaves office everyone will say good things about him as they do about all of our Presidents. We have short memories. Yes he made promises and he had visions. If this were a dictatorship, it would make sense to hold him solely accountable for his achievements. But since he has to get the ratification of Congress for even picking his team, he can only achieve as much as Congress will allow. Republicans claim the stimulus and bailout were a mistake. They still criticize him for it. Constructive criticism is a great thing, but criticism strictly for political gain is negative. I've not heard any Republican say anything went well. Hopefully not, he is an incompetent, ideological moron! It's unfortunate that you have that view because it's completely unfounded. The ideas and policies of said 'moron' have brought this country back from the worst recession in world history. We've gone from decline to growth and to having prospects of a future, and that in spite of venomous Republican opposition. Please explain how a moron achieves that. If fighting for growth and economic progress and stability for families is a nightmare, I don't have the courage to ask what plan would be a dream. I hope he achieves his plans and more because then, I know my children would have a better life than I've had. I doubt strongly that our president has anything but love for this country. The problem with America is that you run on a two party system , very rare in the civilized western world. Let the far left and far right have their own party and if they get enough votes they will have representation in Washington. This way each party can truly run on it's own beliefs and principals without pandering to special interest groups within their party. The far left is just as bad if not worse than the tea party . This two term presidency is destroying your country , no leadership , more and more borrowing and spending and a divided country that has resorted to mean spirited name calling. Obama lacks maturity as he showed once again in his speech today . obama's agenda of trying to destroy this country is still on, but thank God the Tea Party is preventing it from happening. If the Tea Party had their way, the country would be in default right now, hundreds of thousands of federal workers would still be out of work and the economy would be destroyed. I'd like to know how that Tea Party plan would not destroy the country. As long as irrational, emotionally-stunted hyper-conservatives and their allies continue devoting every second of every legislative day to nothing except thwarting the President and thwarting America by any means they consider necessary, then yes, his agenda is definitely impeded, and progress in American society is stopped. As we've just seen. The President's agenda went askew when he ignored our economic meltdown to focus on the ACA. His first priority after stopping the wars should have been to reinstate Glass-Steagall to reverse the Bush Doctrine and reregulate Wall Street and get rid of Too Big to Fail!!! Why don't reporters ever ask those congress people if they live from week to week on their congressional paycheck and what do they pay for them and their families health insurance? Obviously, they don't live like ordinary Americans and they have forgotten what it's like to live day to day. I don't object to people doing well – I object to them not understanding what it means to live day to day, week to week, month to month. The debt will not doom this country, silver spoons and their thought of let them eat cake will. I completely agree. I think Congress is completely disconnected from the reality of average American families. The fight to delay health care reform is by people that already have comfortable insurance policies and don't need the reform, completely ignoring the millions for whom the reform is a lifeline. Also, shutting down the government for weeks,leaving hundreds of thousands of families without income while Congress is immune to the effects of their actions is ridiculous. I think the US made a fool of itself this last couple of weeks. The opposition is nothing but an attempt to nullify the Presidential election by other means. The GOP can't win on the merits or the track record of its ideas. It's resorted to lower and lower kinds of trickery and deception. At some point the bottom falls out. They cannot win at this. When I saw Sen. Rubio clamoring to re-attain his tea party credentials by vowing that this fight isn't over with, I knew exactly where we stand. These tea party devotees have no interest in governing. Their whole premise is, in reality, inothing more than blatant racism. It's disguised, barely, as many other things for public consumption. They are truly a sad lot. So monsignori...each time the NAACP speaks out agains actions of whites but not blacks, as well as the Panthers that is not racism? I think the Tea Party members are a bunch of idiots, but hypocrisy is just as stupid and that my friend is exactly what you are. A hypocrite. It's not racism. Just because someone doesn't agree with leftist political doctrines doesn't make them a racist, although you would like that to be the truth because it validates your position. Obama (1/2 black, 1/2 white) is a very left leaning politician. He ran as a centrist and has turned very far to the left. As a result, unfortunately, the Republican party has turned too far to the right. At some point, although not now, they will be forced to talk and compromise. Sadly, neither side understands that. So now fiscal responsibility is racist? Bringing the economic disaster with a government shutdown and default can hardly be classified as fiscal responsibility. The 24 billion dollars the economy lost doesn't help the deficit in any way.